My sister and I haven’t seen each other in almost a year, and we’ve planned to meet for a few days in Paris. 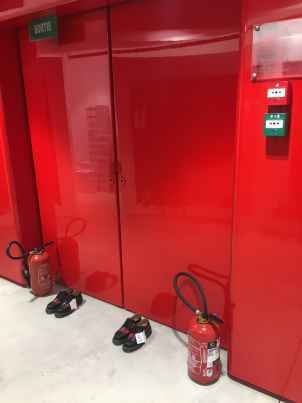 We’ve also planned to visit the Comme des Garçons store on Rue Faubourg. With a decade between us, with divergent opinions on so many topics, we agree always on Rei Kawakubo. The store is discreetly demarcated from the surrounding entry-ways by gold signage: COMME des GARÇONS. We enter a shady courtyard with a café where on the quiet afternoon people are having their little coffees and bubble water. 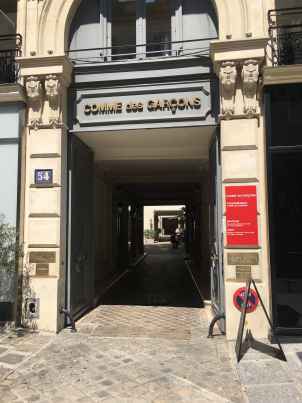 Further on, the first courtyard opens up into a second, a Comme complex: on the left, the entrance to the shop carrying diffusion lines, a little further down, the Trading Museum, and on the right, the regular store, which includes everything in the CDG family tree. 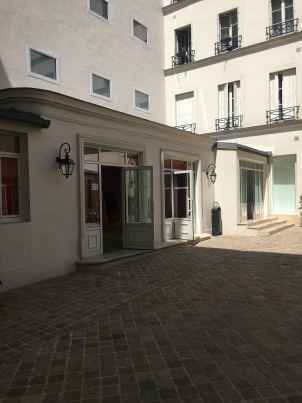 Entering the courtyard is like walking into a Comme colony, with three separated shops cuddled together but broken into distinct nodes. The foyer in the interior of the main shop is walled with red plastic. Low ceilings, somatic tones, the impression of entering a retro-futuristic womb. Kawakubo is the great matriarch of the line she launched in 1969, and in her shops she gathers her friends and family around her—Junya is here, Kei Ninomiya, and all of the Comme diffusion offspring. A woman is born with all of the egg cells she will ever produce, which means when your grandmother was pregnant with your mother, you were also there. This incredulous biological occurrence is mirrored in Comme des Garçons. 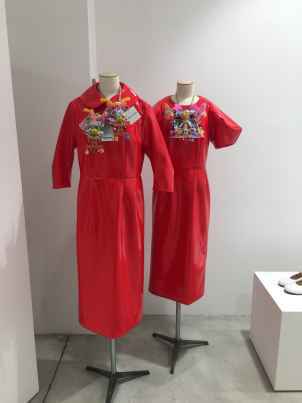 At the time the brand formulated, all that would spring from Kawakubo was present, waiting to be born. I think she would hate this analogy. Rei found the name for her brand in a line from a Françoise Hardy song, in which the singer laments being single amongst crowds of paired-off lovers. 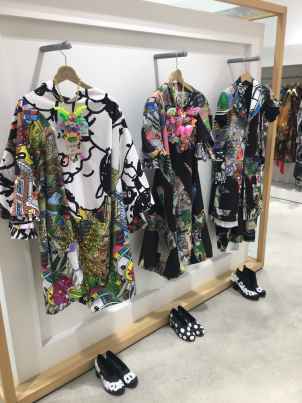 For someone who has been in a decades-long partnership, Kawakubo is quite openly resentful of romantic dependency, famously stating that her clothes were made for women who don’t care what their husbands think. I imagine her distaste is rooted in the lack of imagination that normativity ensures. Partnering off, dressing to please, dressing for gender, dressing for age—all this structure and normalcy is irritatingly dull to her. Being a body is dull to her. Fixed states bore her. I almost get the sense it pains her, and that her work is made in response to that pain. At the Trading Museum across the courtyard, Comme collects their favorite designers and sells their product, encouraging the same sort of appreciation (without push for purchase) that a museum space does. 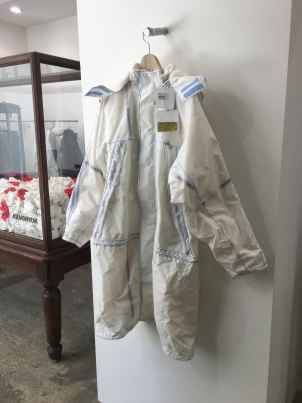 There is a curated selection of publications at the register, and an installation by Kanghyuk, where deployed airbags have been twisted into roses and collected in a vintage glass display case (presumably the same ones seen in the Tokyo store, borrowed from London’s Victoria & Albert Museum). 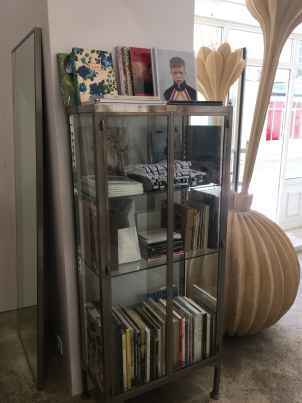 Further on, there is another glass curiosities case, with books by SoHo-based publisher and distributor, IDEA. Kanye, Juergen & Kim. Brianna Capozzi’s Well Behaved Women. Gucci x Peter Schlesinger’s Disturbia, the Pre-Fall 2018 hardcover-bound lookbook homage to the films of Dario Argento (leave Dario alone, fashion people! ), books on architecture, art, design. 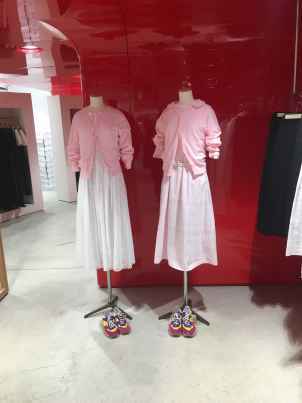 The range here is a mix of emerging brands—Molly Goddard, Craig Green, Kanghyuk, Gosha Rubchinskiy. L.A.’s Waggy Tee, a line of recycled t-shirts bleached and painted with optimistic messages, hangs unexpectedly on a rack in the back, far from home. Using your retail space to promote other labels is pretty much the antithesis of what most other brands are willing to do, because it is selfless, and commerce and selflessness rarely interact. 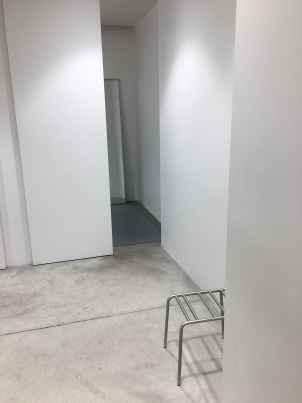 The name of the shop—Trading Museum—implies a reciprocity that isn’t exclusively commercial, a concept the brand is no stranger to, having opened their multi-brand department store Dover Street Market almost fifteen years ago. It’s a putting of the money where the mouth is, a business move that affirms the genuine dedication to and appreciation of art and design that the brand has managed to retain for decades. Rei Kawakubo wants to produce the best and most creatively fulfilling work possible, and she wants to celebrate those who are doing the same, even if they might otherwise be viewed as competition. 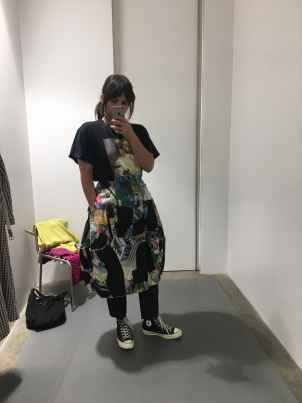 I wander between the shops for a while and then I try on the glitched pixel print skirt I’ve had my eye on all season. It’s heavy, it’s sturdy. It feels anachronistic. Things just aren’t made like this anymore. It’s like a thrift find—imitating that intimate, empathetic moment when you pick something up and realize it’s handmade, observing the irregular stitching on the inside-out. The construction feels human, with an imperfectness that elicits tenderness. You would have to know me to know how rare it is for me to say this about almost anything: it feels worth the money. It’s the originality of the design, but it’s also because these aren’t even really clothes—they are works of art, and so, invaluable. Where all luxury brands would like you to believe their garments possess an aura worthy of the markup, Comme des Garçons is one of very few that is convincing. The clothes are like hand-me-downs passed on by a respected ancestor. The feeling is worked into the grunge-goth aesthetic at the roots of the brand (appearing as frayed edges, undone seams, wayward holes), but is also related to weight, and an inexplicable, innate belovedness. In some pieces I am reminded of childhood, a necklace of toys glued together and strung up on a chain, and in others of aging. Black matronly suits like funeral attire, cardigans that conjure my granny and her scratchy Balmoral knits. The designs encompass life at all stages of development, even metonymizing the body through organ-like garments—amorphous, lumpy, blood red, clot black, cheek pink, bone white. Ideas of the body, how they constitute themselves singularly, but also how they congregate into cultures, as families, as communities, come to me when I consider what Kawakubo has accomplished. Just as she has built up an extended family of creative cousins (from John Waters to Frank Ocean), and a community of genetically compatible followers, her designs have twisted perception of what the human form can be, of how it can be assembled. Perhaps that is what my sister and I, with our distinct bodies and distinct insecurities, both love about her work—it’s ability to transform, to open up a new relationship to yourself through shape, to allow a momentary transcendence from the body by reconfiguring its outline. 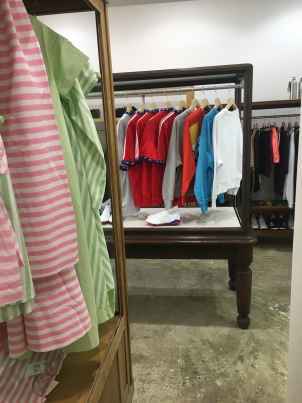 As I exit the store, my sister already waiting outside, I notice two mannequins, prim in matching pink cardigans, long white skirts, and bright trainers. The image is sweet, but on the verge of tipping over into perversion, like a twin trope in a horror film. And it encompasses the type of imbalance that Comme des Garçons strides, forever exploring normative assemblage and then disturbing it, undoing the body like a slasher. Olivia Whittick is an editor at SSENSE. She is also managing editor at Editorial Magazine.